They hide the truth and cover the space restricting the view. Marring their perfect, painted form. Learning from their memories that every cobble counts. each one a lesson in humility. And with an open heart I share each broken vessel. and make it whole once more. Each one a link of love and lessons learned. The summer holidays are in full swing and the kids are all doing their own thing. My youngest just wants to be out in the street with her friends, my oldest can’t seem to make it out of her bedroom and off of Facebook and my middle daughter is quite happy chilling to her music or watching girly programmes like Friends with her best mate or meeting up with her mates at the skate park. 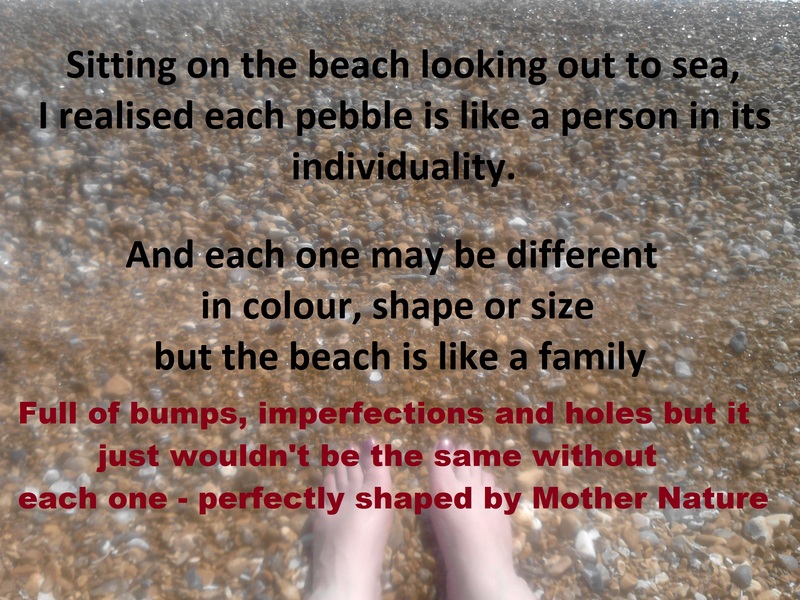 It seems that I now have 3 very different pebbles on my family beach to try and keep happy throughout the long summer break and try as I might, I have come to the conclusion that I will never be able to keep them all happy by giving them a timetable LOL. Sometimes you just have to let the tide wash in and carry them where they will and hope they don’t get lost in the depths!